I am the 4th stop on the hop today--you should have just come from Candy's blog, Candy's Craft Corner. 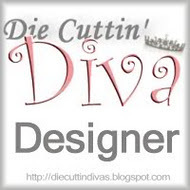 I am so excited to be a new member of the Die Cuttin' Divas Design Team! This is the first design team I've been on, and I'm honored to be a part of this group of very talented crafters. Please be sure to hop through the whole lineup for some inspiration on the sketch challenge for this week, and then enter your creation back at the Die Cuttin' Divas blog for a chance to win an Art for the Heart kit, which has been kindly donated by Suzanne, one of the DCD design team members. You will have one week to plan, create, and submit your project. The winner will be announced next Tuesday. 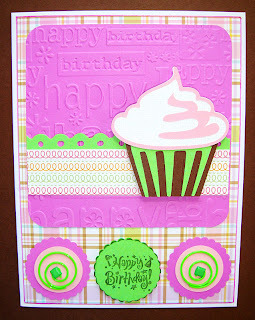 Your creation should include a cupcake and a happy birthday sentiment in honor of two birthdays this month: Die Cuttin' Divas' one year birthday, and one of the new designers, Nikki. Here's my card following the sketch. And on the inside, I stamped this sentiment with a wooden stamp I found at Joann's a while back. Isn't that the cutest phrase?! This card is 5 x 6.5. I think it's a great size; not too big; not too small. The patterned papers are from the DCWV Glitter Sweet Stack. The purple cardstock is cut at 4.25 square with rounded corners. This came from my stash and was already embossed with the Cuttlebug Happy Birthday folder as a card. So this challenge was the perfect time to use it. I punched the scalloped circles with a Marvy punch, stamped the green circle with Happy Birthdy and popped that up on another green circle. The cupcake is cut at 4" using From My Kitchen. It had a cherry on top, but I didn't use it. I wanted the icing to really show up. I love how it looks! 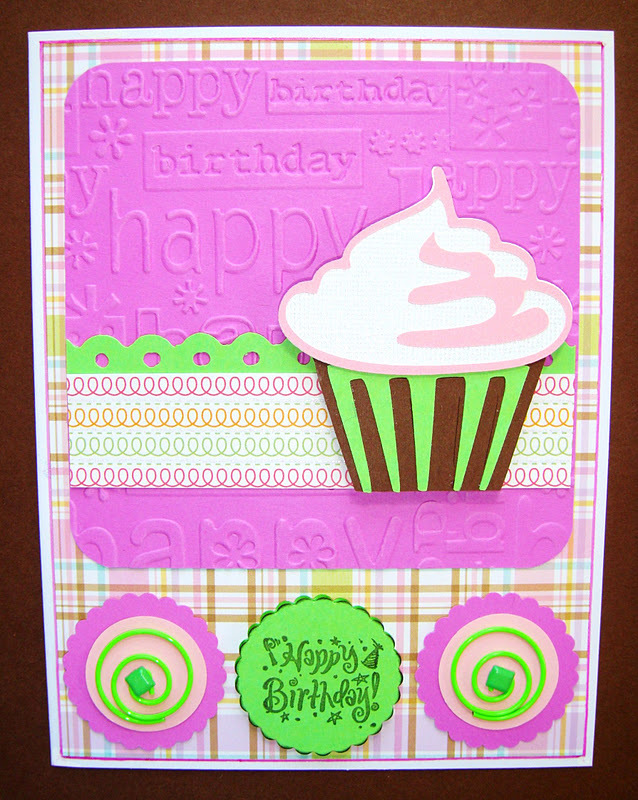 Under the cupcake is a green border punched with a Fiskars punch and more patterned cardstock from the Sweet Stack. To finish off my card, I attached the two green circle paper clips on the purple circles with a green brad. I have some candy to give away for going through the hop today. All you have to do is leave a comment on this post. I would love for you to become a follower, but it's not a requirement. Here's a picture of what I'm giving away. Your next stop is Cheryl at Cards by CG. Thanks for stopping by and joining in the hop today, and check back next Tuesday for the next Die Cuttin' Divas challenge!! Thanks so much! Love the use of the Cuttlebug folder. I need to add that one to my small collection. The sentiment is so true!! cute colors. The sentiment is adorable. Love the cupcake!! Especially the two smaller cupcakes with the paper clips attached! The texture on this pink beauty is amazing! Seriously, this is your first design team? No way! Where have you been hiding. We've got to get you exposed. You're work is darling. Love what you created for this challenge and looking forward to working with you. Love your card...great job. I love the sentiment. Thanks for the chance to win. Love how you used the paper clips, really like the pink & green together! Yummy cupcake. Now I just need a glass of milk. : ) Glad you are part of the team! Congrats my friend!!! You are going to be GREAT!! Oh my gosh what an adorable little card!!! Great take on the sketch and thanks for the chance to win! Yummy cupcake card, what a great Birthday someone will have getting this. Super cute card. Love your cupcake and the sentiment is the best. Congrats on your great news! Adorable card, nice embossing! What a beautiful card.I love the colors. Glad to have you on the team.I look forward to seeing the projects you will be creating. You are so sweet to always stop by my site. Congrats on becoming a DT member. I did try for the PK DT but did not make it. Maybe one day. I love the colors and the sentiment! What doesn't a cupcake make better. Congrats on becoming part of the design team.....I am your newest follower. Congrats on the DT Pat!!! Super cute YUMMY card! i will have to give this sketch a try:) Happy New Year Pat!!! Congrats on making the cut at DCD!!! :) How exciting! I've never used that cupcake from From My Kitchen. In fact... did I EVER use that cartridge?! LOL, shame on me! I need to put down the digis and dust off my Cricut! congrats, pat!! celebrate with this yummy cupcake and tried one!!! :) yum!! yum! Congrats being on the design Team, they are lucky to have YOU! You are one of the sweetest most caring persons I know and will be a huge contribution to their team! What a bright and cheery card that anyone would enjoy receiving. Good job on the challenge. Love your color choices. This is a cheerful card. Thanks for sharing. Like the cupcake card. Especially like the embossing & colors used. Thanks for awesome giveaway chance.